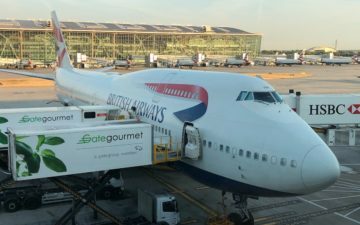 British Airways has their own lounge at SFO, which is not only open to their passengers, but also open to passengers traveling on other oneworld airlines. I’ve reviewed the lounge before, and it’s… not great. While the lounge has nice views, it’s really outdated, and badly in need of a refresh. British Airways has done a good job renovating some of their other lounges. So there’s some good news on that front. The British Airways Lounge San Francisco will be closing on January 2, 2019, for a renovation. While no exact reopening date has been provided, the lounge is expected to open once again in summer 2019. In the meantime, British Airways premium passengers will be directed to the China Airlines Dynasty Lounge, which is also located in International Terminal A.
I hope that British Airways really spruces up their San Francisco lounge. The new decor style they’re going with in some of their lounges feels more like what Cathay Pacific offers, so I quite like that, and hope that happens here as well. The British Airways Lounge also has a small first class section, so I’m curious to see what they do with this. Currently it’s just a small room with a slightly better drink selection, so even when I have access to it, I choose to use the business class section instead. I wonder if they’ll keep that area, and if so, if they’ll actually try to do something special with it. Given that the lounge will be closed for over six months, hopefully they do more than just replace the furniture. Was just in the First Class ‘lounge’ on December 22nd – this overhaul is well overdue as the lounge is appalling, and a real let down. The only benefit is the direct lounge boarding door. I understand they chose China airlines over Cathay pacific to accom their biz and F passengers as rates are higher for Cathay pacific. Agree with you on the First section of the lounge. Who wants to sit in a tiny little room? I’ve always sat in the Club World section of the lounge. What’s really nice about the BA lounge is that there’s direct access from the lounge to one of the two gates that BA uses. You only have direct access to the plane when BA uses a 747 or 777. The A380 they also use daily cannot use the gates on that side so you have to walk back into the main terminal area when it is time to board. The F lounge is a joke. Not only is it near identical to the Business Class lounge, but you can freely walk back and forth between the two. Nobody checks so if a J passenger wants champagne, they just stroll into the F lounge and help themselves. I use the Cathay lounge and then move to the BA lounge if it’s a 747, and not if it’s a A380. This is the second go BA have had at redoing the SFO lounge but this one is going ahead. The last iteration was supposed to start last year and would have included the installation of a mezzanine floor to provide more floor space. Great news, especially on the A380 days it’s just packed, some of the senior staff had hinted it was closing and that the refurbishment would include a second ( mezzanine) level for the first class area, fingers crossed here. The BA Terraces Lounge at SFO is not nice at all. The look and feel is 1990’s office waiting room, with inferior food and little in the way of amenities. 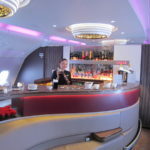 I was flying Qantas from SFO to SYD last month in Business Class and was directed to use either the British Airways, Cathay Pacific, or Air France/KLM Lounges. I first went to the BA one because the gate for my QF 74 flight to Sydney was departing next door. I turned around and walked out. The Cathay Pacific lounge is indeed a lot nicer. Furnishings are nice, the lounge has a quiet feel to it. The food offerings are not great though and the shower facilities, as great as they are for being available, are very basic. The AF/KL Lounge is the old NW World Club and is the worst of the three. @Euro – basically all the factors you mention come into it! They often have different access policies. BA for example does not sell access or allow it just because you have a particular credit card but AA does. Also different airlines offer different products so at for example JFK BA offers pre flight supper only for passengers flying in Club World. So other OW passengers get the normal sandwiches etc offer. But there are some contradictions. At LHR T3 for example BA passengers can access the CX and QF lounges and BA appears happy to bear the costs of that. It says something that on the BA flyer talk board they recommend using any other lounge (except the AA one but that might change once it gets upgraded and becomes a flagship) than the BA one! Though because of the economics some airlines have opened up some of their lounges for access when not otherwise being used so IIRC at IAD they open up the BA and VS lounges in the morning / early afternoon but then close for an hour or so for cleaning etc before opening up again as the airline specific lounges before the evening flights start to depart. I was also in the first class lounge on 12/22. The small room didnt bother me. What bothered me was the never ending train of business class passengers going in there to check if there was better food. More people were in there than first class seats on the plane, and it got crowded with every seat occupied. The small room is sufficient if only legitimate first class passengers were in there. They need to check tickets for the first class lounge and impove the food there. Remodeling isn’t going to help. Heads up, Cathay is actively turning away BA customers from their lounge. The China Airlines lounge is way over-crowded prior to the LHR bound 388 flight. Likewise, have BA first ticket and BA check-in advised can’t use Cathy lounge. Tried anyway, as Cathay website still says ok, but was turned away. China Airlines ‘exclusive lounge’’ was abysmal, with only biscuits and dry focaccia on offer. Aircon was not working properly either. I would stay in the restaurants on the main concourse, which are much nicer. I was just at SFO. I try to go to Cathay lounge and way turned away.